Living with a skin condition like psoriasis or eczema is hard. Around 60% of people with psoriasis suffer with depression and up to 48% report feeling anxious. 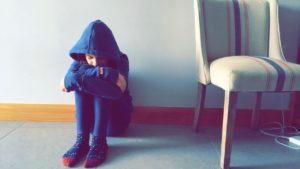 While we know about the psychological impact of psoriasis on adults, less is known about how it affects children despite the fact that in a third of people their psoriasis first started before the age of 20. The teenage years are a particularly tough time to develop a condition which is often uncontrollable and affects appearance so greatly. A recent study (Salman et al, 2018) looked at the quality of life of 58 children and adolescents with psoriasis and found that over a third of their sample rated their skin condition as having a moderate to extremely large impact on their quality of life, even when their actual symptoms were rated as mild. Having a poor quality of life was associated with higher levels of anxiety and depression. More than that, the researchers discovered that the quality of life of the families was also diminished. This means that if you’re a parent of a child or teenager with psoriasis it will affect your well-being too. For those of you in this position, it won’t be surprising news. You will be visiting clinics and hospitals with your child and helping apply treatments or nagging older children, not to mention all the worrying that goes hand in hand with seeing your child suffer. Studies have shown that having psoriasis can affect an individual’s life choices and interfere with their pursuit of goals from career path to family life and educational attainment (Warren et al, 2011 and Kimball et al, 2005). All this makes for gloomy reading but there are things you can do to support your child and mitigate these effects. Follow the link to my blog for my top tips on supporting your child. Look out for sudden changes in behaviour or signs of stress, which is not always easy in teenagers. Follow this link for advice from Action for Children on how to spot the signs of mental health issues in children. Don’t hesitate to ask for professional help if you’re worried. It’s hard to watch your child have to deal with a chronic condition like psoriasis and you may need to get support for yourself. Be there for them, listen to them and support them to develop coping strategies. This will stand them in good stead throughout their lives. Salman, A., Yucelten, A. D., Sarac, E., Saricam, M. H., & Perdahli-Fis, N. (2018). Impact of psoriasis in the quality of life of children, adolescents and their families: a cross-sectional study. Anais brasileiros de dermatologia, 93(6), 819-823. Warren RB, Kleyn CE, Gulliver WP. (2011). Cumulative life course impairment in psoriasis: patient perception of disease-related impairment throughout the life course. Br J Dermatol.164 (1),1-14. Kimball AB, Jacobson C, Weiss S, Vreeland MG, Wu Y. (2005). The psychosocial burden of psoriasis. Am J Clin Dermatol. 6 (6): 383-92. Thanks for your blog Catherine, as a parent, seeing your child suffer through something you can’t physically help with is always hard, knowing other people are going through the same thing often helps but your helpful support tips bolster that twofold. Thank you! You’re welcome. I remember how hard it was having psoriasis as a child – and difficult for my parents too. Hope these tips make it a little easier for families in the same situation.